I challenge anyone to read Christopher McDougall's Born to Run: A Hidden Tribe, Superathletes, and the Greatest Race the World Has Never Seen and not be inspired—to run, to be healthy, to be, well just, better. Born to Run is about McDougall's investigative adventure into the world of running, ultramarathons, the shoe industry, and the Tarahumara Indians, a seclusive group of "superathletes" known for their running endurance and speed. The tale begins with a question, "How come my foot hurts?" and ends with a race between a few elite ultrarunners and the Tarahumara Indians in the Copper Canyons of Mexico. In between are a number of answers, questions, and challenges. It was difficult to put Born to Run down. The book is simultaneously thrilling and informative. It not only recaptures the excitement of past distance running races (like the 1995 Leadville 100), but it also tells the backstories of BtR's protagonists — Ann Trason, Ken Chlouber, Caballo Blanco (or "Micah True"), "Barefoot Ted" McDonald, Scott Jurek, Jenn "Mookie" Shelton and Billy "Bonehead" Barnett. Even still, the book serves as an indictment of the running shoe industry, specifically Nike, while also laying out a compelling case that human beings evolved to be runners—chasing prey down, out-enduring them via the persistence hunt. At under 300 pages Born to Run, like the runners and races it describes, covers a lot of ground quickly. Distance running was revered because it was indispensable; it was the way we survived and thrived and spread across the planet. You ran to eat and to avoid being eaten; you ran to find a mate and impress her, and with her you ran off to start a new life together. You had to love running, or you wouldn't live to love anything else. And like everything else we love—everything we sentimentally call our "passions" and "desires"—it's really an encoded ancestral necessity. We were born to run; we were born because we run. 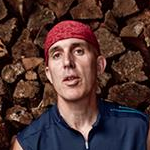 We're all Running People, as the Tarahumara have always known. Born to Run is one of those rare books that captures within its pages an authentic human experience and conveys that experience directly to the reader. It's a book in which you are awed by superhuman athletes while still seeing their core humanity. And therein is one of McDougall's primary takeaways: every human being was born to run, the design being coded within our DNA. Since this book review is for the Vibram fivefingers fan community, I'd be remiss not to note that BtR gives a hearty mention regarding VFFs, specifically via Barefoot Ted, who apparently inspired Vibram USA's CEO, Tony Post, to go for a run in his fivefingers. I'm guessing this was back in early 2006. "El Mono" (Barefoot Ted) also made use of his fivefingers at various times during his trek to race with the Tarahumara. And as previously noted on this site, Christopher McDougall seems to enjoy his fivefingers for running these days, too. Conclusion: BtR is a fantastic read, and I whole-heartedly recommend it. More than anything, I expect this book to spawn the next generation of runners, and I'm optimistic that it will take barefooting (or pseudo-barefooting/minimalist footwear) mainstream. Born to Run is yet another step in a more general movement towards acquiring a higher understanding of what it means and requires to be human. If you'd like to snag Born to Run, just click this link to pick it up from Amazon.com. How funny to see this here - I just saw this book featured at Trail House in Frederick, MD, when I bought my Sprints two days ago. He's going to be speaking there soon. Been wearing VFFs for a couple weeks now, just stopped by B&N yesterday, picked up the book. Trying to pace myself on reading it, don't want to get through it too fast, but its so good. Started reading your book a few days ago,can't seem to put it down or get it out of my head. Not an ultrarunner, but your book has inspired me to a whole new level of trail running. I was really skeptical if this book would be really that good. This Christmas my father and I blew it by getting us the same present: Born to run by Christopher McDougall. So i read it and was blown away; I loved it, every page, after I almost finished it at one in the morning I went out running barefoot at 28° F, only to come home to finish it.